Dominique Farge, Hanadi El Ayoubi. Contributed equally to the manuscript. Venous thromboembolism (VTE) is an independent prognostic factor of mortality in cancer patients, and its management remains a great challenge in oncology. Clinical practice guidelines (CPG) addressing the treatment and prophylaxis of cancer-associated VTE are heterogeneous and sub-optimally implemented worldwide. With the objective to homogenize existing guidelines and enhance their dissemination, we performed an extensive literature analysis of the studies and guidelines published over the last decades and summarized the recommendations for management of VTE, including the role of direct oral anticoagulants (DOACs) in the treatment strategies. All recommendations were formulated according to an evidence-based medicine approach, using the grading system [Table 1]. VTE is a significant cause of morbidity and mortality in patients with cancer. The close relationship between cancer and thrombosis is known since 1865 when Armand Trousseau first described the clinical association between idiopathic VTE and occult malignancy. Cancer may affect all three components of the Virchow triad: venous stasis, blood components, and vessel damage, thereby inducing the alteration of normal blood flow and increasing the risk of thrombus formation., This hypercoagulable state associated with cancer results in a fourfold increase in thrombosis risk and a higher risk of mortality, irrespective of cancer stage,, and chemotherapy elevates this risk even more. More importantly, we witnessed a steady increase in the incidence of cancer-associated thrombosis over the past decade,, probably due to patient's increasing age, greater thrombogenicity of chemotherapy regimens, and better detection of incidental thrombosis. At present, VTE has become the second leading cause of death in cancer patients after metastasis  and represents an independent prognostic factor of death in patients with cancer. Even though thromboembolic diseases are a rather common complication in oncology patients worldwide, there has been limited advancement in the management of cancer-associated thrombosis since the introduction of low-molecular-weight heparin (LMWH) for long-term therapy. In fact, treatment of VTE in the cancer population remains a great challenge. Numerous published studies support the evidence of an inconsistent and inadequate implementation of existing CPG, which is likely a factor for the lack of consensus and the heterogeneity of management and prophylaxis strategies in clinical practice.,,,,, Further, anticoagulant therapy remains a burden and is viewed as having a negative impact on patient's quality of life. It is associated with greater risks of VTE recurrence and major bleeding complications  and may limit the therapeutic options to treat underlying cancer. Cancer is the third cause of death in Saudi Arabia (SAR) after cardiovascular diseases and communicable diseases and it represented 10% of the death rate in 2014 according to the WHO report. Clinical data from SAR related to VTE in cancer patients are scarce. In a retrospective study of 701 patients with solid tumors or lymphoma treated at a tertiary care center in Riyadh from 2004 to 2009, VTE was diagnosed in 6.7% with 79% of VTE patients having an advanced cancer stage. A retrospective review of 2286 patients treated in SAR for cancer between January 2013 and December 2014 revealed that VTE was diagnosed in 144 patients (6.3%) of total oncology center admissions. The mean age of the studied group was 53.2 years. Pulmonary embolism (PE) was documented in 39% while 61.8% had deep vein thrombosis (DVT). Fifty-two percent of the patients had distant metastasis. The mortality during the study period was about 31.8% in patients with VTE. The risk was higher in patients with advanced carcinoma stages, poor Eastern Cooperative Oncology Group performance status, and gastrointestinal adenocarcinoma. Recently, a single institute from SAR reported 132 (7.87%) VTE cases among 1678 cancer patients, with female to male ratio 1.3/1. Thirty-one patients (23.5%) were diagnosed with VTE and cancer simultaneously, 74 patients (56.1%) were on chemotherapy, and 28 patients (21.2%) were on best supportive care. VTE was symptomatic in 110 patients (83.3%) and asymptomatic in 22 patients (16.7%). Lower limbs were the most common site (42.4%), with the highest incidence in patients with advanced stages (93%). Forty-nine (37%) patients were receiving LMWH as prophylaxis. Median survival in months for patients with VTE prophylaxis versus without prophylaxis and asymptomatic versus symptomatic was 12.6 versus 6.3 (P = 0.12) and 9.8 versus 12.4 (P = 0.885), respectively. Such studies from the developing world highlighted the underutilization of thromboprophylaxis, the necessity of early detection and the need to adopt guidelines tailoring the regimen to the risk of developing thromboembolic complications in cancer patients. The incidence of VTE in patients with cancer has increased in recent years., The observed worldwide increase in rates of VTE, particularly in treated patients (47% in chemotherapy treated patients versus 26% for those not receiving chemotherapy), might be explained in part by the use of newer chemotherapy agents. Better performance of diagnostic technologies may also have played a role, with a trend, for example, of an increased likelihood of PE diagnosis in patients undergoing systematic staging computed tomographic (CT) scans and follow-up evaluations. VTE events represent the second leading cause of death in cancer patients after metastasis  and are associated with poor prognosis, irrespective of cancer stage., When cancer is diagnosed at the same time or within a year after VTE, the risk of death at 1 year is three times greater than for cancer patients without VTE. In hospitalized neutropenic patients with cancer, a VTE event increases the risk of death by 2 compared to those patients who do not have a VTE. Finally, patients who survive a thrombotic event are at risk for VTE recurrence and bleeding or may suffer from sequelae from the initial event, such as increased bleeding, postthrombotic syndrome, and pulmonary hypertension.,, The cumulative risk for VTE recurrence reaches 30%, and the economic impact of VTE is significant. These correspond to hypercoagulability, venous stasis, and alteration of the vascular wall - known as the Virchow triad. Specific risk factors that can induce one or more of these states  may influence or increase the risk of VTE in a patient with cancer.,, [Table 2] summarizes the risk factors for VTE in malignancy. In a German study  documenting cancer therapy and DVT risk factors of 507 patients with cancer, factors that were predictive of an increased risk of VTE included inpatient treatment (P< 0.0001), C-reactive protein (P< 0.001), chemotherapy (P = 0.0080), fever (P = 0.0093), prior DVT (P = 0.0275), and family history of DVT (P = 0.0598). Considering the number of risk factors, the predicted VTE risk increased with the number of factors in both outpatients (odds ratio [OR] 1.85, 95% confidence interval [CI] 1.18–2.88, P = 0.0071) and inpatients (OR 2.34, 95% CI 1.63–3.36, P ≤ 0.0001). If all factors were absent, the predicted risk of VTE was 2.3% but rose to 72% if all risk factors were present. Finally, the long-term use of central venous catheters (CVC) in cancer patients represents an important risk factor for the onset of thrombotic events. Depending on the study, the demonstrated incidence of symptomatic VTE is 0.3%–28.3%. PE is the manifestation of VTE in 15.9%–25.0% of CRT. In a study by den Exter et al. comparing cancer patients diagnosed with either symptomatic or incidental PE, they reported high rates of recurrent VTE, bleeding complications, and mortality in both groups; the 12-month cumulative incidence of recurrent VTE was 13.3% in patients incidentally diagnosed versus 16.9% of symptomatic patients (P = 0.77); the risk of major bleeding complications was similar for both the groups (12.5% for incidental vs. 8.6% for symptomatic patients, P = 0.5) as was the 12-month mortality risk (52.9% for incidental vs. 53.3% for symptomatic patients, P = 0.7). 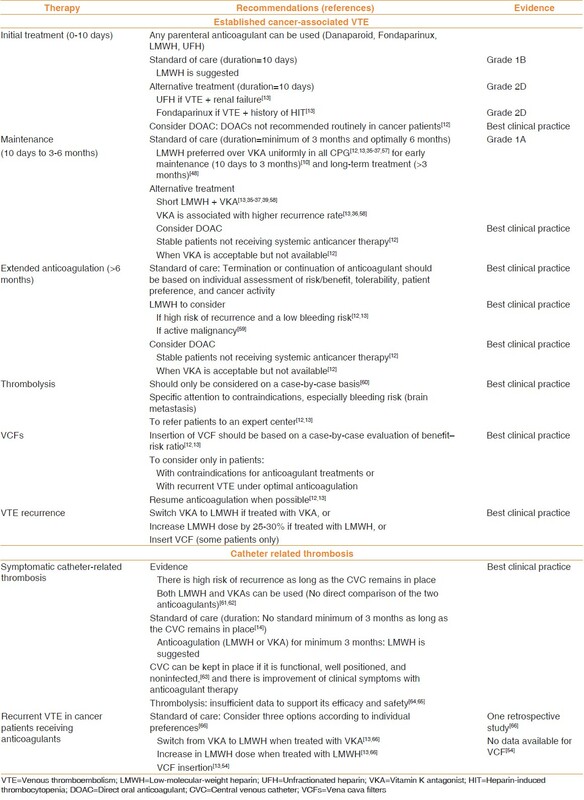 Given the prevalence of VTE and its associated morbidity, we propose herein to review and summarize the consensus of international CPG developed in 2013, and updated in 2016 for optimal management of cancer-associated VTE, including guidance for the use direct oral anticoagulants  (DOACs). Implementation of these guidelines worldwide and among SAR physicians and health-care professionals with appropriate education strategy is necessary to underscore the gravity of VTE and the urgency for timely prophylaxis, effective treatment, and follow-up of VTE episodes in the cancer population. The management of established VTE and implementation of specific prophylactic regimens in oncology have become an area of interest over the last 10 years because cancer patients often present with a variety of risk factors and comorbidities. Several difficulties may interfere with optimal implementation of these guidelines,, including fear of bleeding, lack of multidisciplinary approach, and absence of consensus among various national and international guidelines, which have probably contributed to knowledge and practice gaps among physicians, and heterogeneous practices with inconsistent or inadequate management of VTE in oncology. This lead many organizations, such as the Joint Commission, the Surgical Care Improvement Project, and the ACCP, to provide strong incentives for improving VTE management practices supporting the implementation of a formal strategy based on multidisciplinary approach to formulate a VTE management and prophylaxis protocol  and track its implementation. Many VTE risk-assessment tools were also formulated. The first 10 days of anticoagulation are a key to prevent the extension of VTE and onset of PE and VTE recurrence. No specific study has yet directly compared the use in oncology of unfractionated heparin (UFH), LMWH, or fondaparinux for the initial phase of VTE treatment. The short-term use of both UFH + VKA and LMWH + VKA was associated with high rate of relapse and major bleeding., Interestingly, indirect comparisons and several meta-analyses provided evidence that LMWH used during the first 10 days has the same efficacy than UFH, with a higher safety profile in terms of relapse, bleeding, risk of heparin-induced thrombocytopenia, and overall mortality., The MATISSE trial compared early treatment with fondaparinux versus UHF or LMWH followed by VKA and showed that rate of VTE recurrence was the lowest with LMWH followed by fondaparinux and then UFH, with similar risk of bleeding. However, fondaparinux should be used with caution in cancer patients considering its long-half time, its contraindication in severe renal failure, and the absence of specific antidote for this drug. 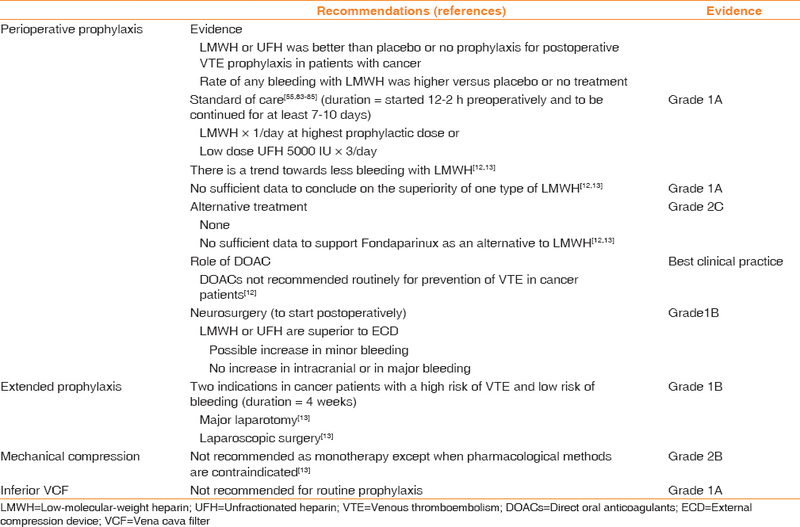 Therefore, in the absence of contraindication, LMWH appears the anticoagulant of choice for initial treatment of VTE in oncology and is preferred in majority of guidelines [Grade 1B] [Table 4]. The superiority of early maintenance (10 days–3 months) and long-term treatment (beyond 3 months) with LMWH [Table 4] over short-term heparin followed by VKA is well documented.,, In the CLOT study, the probability of recurrent VTE at 6 months was 17% in the VKA group and 9% in the dalteparin group (hazard ratio 0.48, P = 0.002). Compared to VKA, LMWH used during at least 3–6 months significantly reduced the risk of VTE recurrence with the same safety profile , and should be considered, in the absence of contraindications, as the standard of care for early maintenance and long-term treatment of VTE, as uniformly recommended in all clinical guidelines. It is usually proposed for cancer patients with a high risk of recurrence and a low bleeding risk and those with active malignancy. The presence of residual VTE on ultrasound-Doppler or the D-dimers levels is insufficient to guide the clinician decision to maintain anticoagulation after 3 months. Recommendations for the management of VTE in cancer patients with challenging situations/brain tumor,,,,, renal failure, thrombocytopenia, bleeding,, and pregnancy  are summarized in [Table 5]. Data to determine the best management of recurrent VTE in cancer patients under optimal therapy are scarce. The current recommendations support considering three options according to individual preferences: (1) switch from VKA to LMWH when treated with VKA, (2) increase in LMWH dose when treated with LMWH, or (3) VCF insertion. The first two options were analyzed in a single small retrospective study  (n = 70 patients) which found no difference in terms of efficacy between the two arms. The insertion of a VCF is another therapeutic option despite the absence of evidence to support its use in cancer patients. VTE is potentially preventable with the use of thromboprophylaxis in appropriate patients. For medically ill patients without contraindications to anticoagulant therapy, several regimens were demonstrated to be effective and well tolerated. However, prophylaxis continues to be insufficiently used in hospitalized medical patients  and particularly in cancer patients who represent an added major therapeutic challenge. The implementation of specific prophylactic regimens in onco-hematology has become an area of interest,,,,, and several studies have illustrated the underuse of prophylaxis in oncology settings,,, probably secondary to the fear of anticoagulants adverse effects. In a Canadian multicenter hospital audit, patients admitted for cancer were significantly less likely to receive prophylaxis than other medical patients (OR: 0.40; 95%CI: 0.24–0.68; P = 0.0007). Of note, neurosurgery for malignant brain tumor may be associated with increased risk of intracranial bleeding, but prophylaxis after surgery with LMWH, UFH, and ECD was shown to be superior to no prophylaxis despite an increased risk of minor bleeding, but with no increase in intracranial or major bleeding. Summary of recommendations in surgical cancer patients is summarized in [Table 6]. VTE occurs frequently in outpatients receiving chemotherapy, and the trials of primary prophylaxis of VTE in medical ambulatory cancer patients under chemotherapy show a benefit from prophylaxis with LMWH., Better risk stratification is necessary to identify the subgroup of patients who should benefit from thromboprophylaxis because of a VTE risk much higher than the bleeding risk. The Khorana score was specifically designed to stratify the risk in cancer patients receiving chemotherapy. The current evidence suggests that primary prophylaxis with LMWH in ambulatory patients treated with chemotherapy decreases the rate of VTE in those with locally advanced or metastatic pancreatic ,, or locally advanced or metastatic lung cancers , without excess of bleeding [Table 7]. However, primary prophylaxis with LMWH might be dangerous for patients with a brain tumor  because of increased intracranial bleeding. These patients experiment high rates of venous thromboembolism. Studies comparing the use of low-dose aspirin, VKA at low or therapeutic doses, or LMWH at prophylactic doses have shown similar effects with regard to preventing VTE;, however, the efficacy of these regimens remains unclear [Grade 2C] due to lack of randomized studies versus placebo or of an observation group. A risk assessment model for the management of VTE in multiple myeloma patients has been proposed by the International Myeloma Working Group but requires to be further validated. Two small studies , did not allow to conclude about the efficacy of antithrombin III (ATIII) or ATIII + LMWH due to the small number of patients. Patients with acute lymphocytic leukemia receiving L-asparaginase may be considered for VTE prophylaxis, depending on local policy and individual patient characteristics (platelet count, kidney function, fibrinogen, and ATIII levels) [Table 7] (best clinical practice). 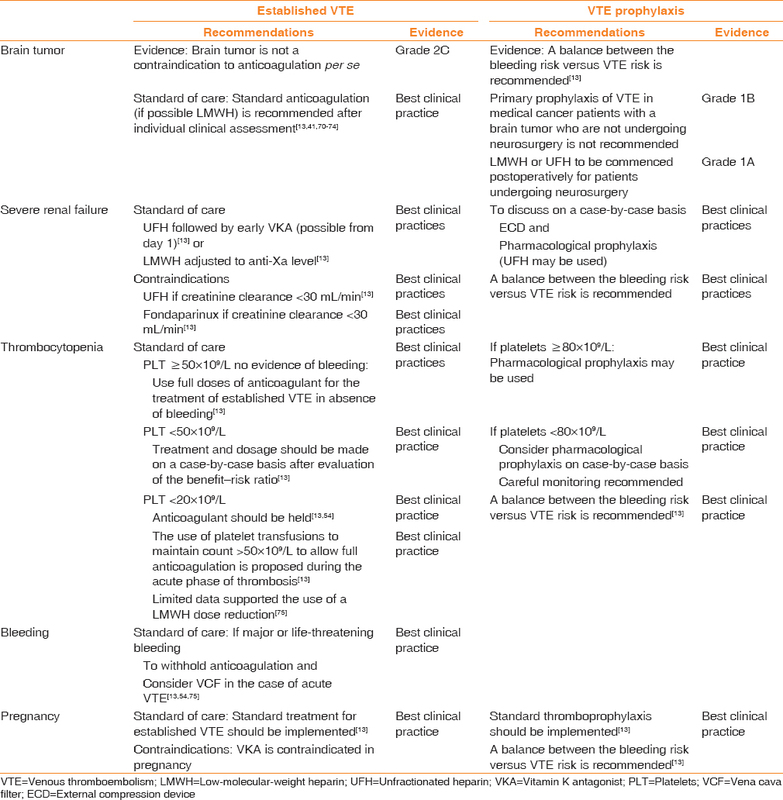 For cases with severe renal failure, thrombocytopenia, and pregnancy, recommendations are based on best clinical practice and a balance between the bleeding risk and VTE risk [Table 5]. In pregnant patients with cancer, a standard thromboprophylaxis is recommended. CVCs are increasingly used in cancer patients. CRT is an important complication and may become symptomatic in approximately 5% of patients. To date, published studies  provided insufficient data to determine the efficacy and safety of LMWH or VKA or thrombolytics , for treating CRT. One study did not support the withdrawal of a noninfected, functioning, and well-positioned CVC. The risk of recurrence is high. Whether the CVC is kept or removed, no standard is established yet for the duration of anticoagulation. Therefore, for the treatment of symptomatic CRT in cancer patients, anticoagulation is recommended for a minimum of 3 months. Both LMWHs and VKAs can be used in the absence of direct comparison of the two anticoagulants in this setting. Routine prophylaxis using anticoagulant is not recommended in patients with CVC , [Grade 1A]. The potential benefit of DOACs as part of cancer-related VTE therapy has not been specifically evaluated to date, and many ongoing trials study their use in cancer patients. However, important limitations for their use in cancer should be taken into consideration including an unpredictable absorption in the specific cancer population, a higher risk of bleeding, unknown interactions with anticancer drugs, and no currently available antidote. Today, DOACs are not recommended routinely for the prevention of VTE in cancer patients  (best practice). Results of ongoing studies are required to determine the potential role of DOACs in this setting, their efficacy, and their safety. The use of DOACs in early maintenance and long-term therapy can be considered for stable patients off systemic anticancer therapy and when VKA is acceptable but not available (best practice): In a meta-analysis with documented cancer subgroups (1132 cancer patients), VTE recurrence was 3.4% with a DOAC versus 5.9% with a VKA, with no difference in rates of major and minor bleeding between treatment groups. In daily oncology practice, cancer-related VTE remains a major concern, being the second-leading cause of death in cancer patients after metastasis. However, clinicians still underestimate the risk and the increasing prevalence of VTE in this population. Although adequate anticoagulation has been demonstrated efficacious and relatively safe for prophylaxis and treatment of VTE in cancer patients, with prolonged use of LMWH as therapeutic option in most of the cases, there is still large heterogeneity worldwide in the clinical knowledge and implementation of the CPG. In addition, many clinicians are reluctant to modify their practice or still have doubt on the tolerability and acceptance of long-term daily subcutaneous treatment  recommended as standard therapy. Tolerance and cost-effectiveness of long-term use of LMWH may account for large heterogeneity in daily clinical practice, and the implementation of specific recommendations for cancer patients is still low. Due to the patient burden and related costs, cancer-associated VTE represents a major public health problem. SAR and other countries worldwide need to implement specific strategies in their health care plan to assess the burden of the VTE in their cancer population and to improve adherence to international CPG among physicians and health-care professionals. This can be achieved with adequate education strategy that highlights the gravity of VTE in cancer patients and the urgency for timely prophylaxis and effective treatment in established VTE and that supports the creation of multidisciplinary approach to formulate VTE management protocols and track their implementation. A minimum standard clinical data set may be used to collect data and create a VTE registry that will help the clinical team to build a comprehensive picture of VTE incidence, treatment, outcomes, and recurrence. Risk factors can be identified using adequate risk assessment models, which may greatly contribute to target prophylaxis for high-risk patients and thus preventing possible future complications. Clinical tools, based on the 2016 international guidelines which are available as web and mobile (iOS App Store or Google Play) applications with decision-tree algorithm, may also be used to assist clinicians in adopting optimal treatment strategies.(www.itaccme.com/app). Adherence to the international guidelines and expert opinion could substantially decrease the burden of VTE, enhance quality of life, and increase survival in cancer patients. Lee AY, Levine MN. Venous thromboembolism and cancer: Risks and outcomes. Circulation 2003;107:I17-21. Lyman GH, Khorana AA. Cancer, clots and consensus: New understanding of an old problem. J Clin Oncol 2009;27:4821-6. Heit JA, Cohen AT, Anderson FA. Estimated annual number of incident and recurrent, non-fatal and fatal venous thromboembolism events in the US. Blood 2005;106:910. Chew HK, Wun T, Harvey DJ, Zhou H, White RH. Incidence of venous thromboembolism and the impact on survival in breast cancer patients. J Clin Oncol 2007;25:70-6. Rodriguez AO, Wun T, Chew H, Zhou H, Harvey D, White RH, et al. Venous thromboembolism in ovarian cancer. Gynecol Oncol 2007;105:784-90. Kuderer NM, Ortel TL, Francis CW. Impact of venous thromboembolism and anticoagulation on cancer and cancer survival. J Clin Oncol 2009;27:4902-11. Cohen AT, Tapson VF, Bergmann JF, Goldhaber SZ, Kakkar AK, Deslandes B, et al. Venous thromboembolism risk and prophylaxis in the acute hospital care setting (ENDORSE study): A multinational cross-sectional study. Lancet 2008;371:387-94. Farge D, Durant C, Villiers S, Long A, Mahr A, Marty M, et al. Lessons from French national guidelines on the treatment of venous thrombosis and central venous catheter thrombosis in cancer patients. Thromb Res 2010;125 Suppl 2:S108-16. Farge D, Bounameaux H, Brenner B, Cajfinger F, Debourdeau P, Khorana AA, et al. International clinical practice guidelines including guidance for direct oral anticoagulants in the treatment and prophylaxis of venous thromboembolism in patients with cancer. Lancet Oncol 2016;17:e452-66. Farge D, Debourdeau P, Beckers M, Baglin C, Bauersachs RM, Brenner B, et al. International clinical practice guidelines for the treatment and prophylaxis of venous thromboembolism in patients with cancer. J Thromb Haemost 2013;11:56-70. Kleinjan A, Aggarwal A, Van de Geer A, Faselis C, Büller HR, Di Nisio M, et al. Aworldwide survey to assess the current approach to the treatment of patients with cancer and venous thromboembolism. Thromb Haemost 2013;110:959-65. World Health Organization – Non Communicable Diseases (NCD) Country Profiles; 2014. Al-Hameed F, Al-Dorzi HM, AlMomen A, Algahtani F, AlZahrani H, AlSaleh K, et al. Prophylaxis and treatment of venous thromboembolism in patients with cancer: The Saudi Clinical Practice Guideline. Ann Saudi Med 2015;35:95-106. Ali AS, Hamodi A, Saudi H, Selwi W. Incidence of venous thromboembolism and related mortality among cancer patients in Tertiary Care Hospital. J Appl Hematol 2017;7 Suppl S1:1-32. Mohammed AA, Al-Zahrani AS, Farooq MU, Ghanem HM, Abdelaziz LA, El-Khatib HM, et al. Pattern of venous thrombosis in cancer patients: Frequency and survival effect; single center experience. Indian J Hematol Blood Transfus 2015;31:439-45. Khorana AA, Francis CW, Culakova E, Kuderer NM, Lyman GH. Frequency, risk factors, and trends for venous thromboembolism among hospitalized cancer patients. Cancer 2007;110:2339-46. Blom JW, Osanto S, Rosendaal FR. High risk of venous thrombosis in patients with pancreatic cancer: A cohort study of 202 patients. Eur J Cancer 2006;42:410-4. Blom JW, Vanderschoot JP, Oostindiër MJ, Osanto S, van der Meer FJ, Rosendaal FR, et al. Incidence of venous thrombosis in a large cohort of 66,329 cancer patients: Results of a record linkage study. J Thromb Haemost 2006;4:529-35. Anderson FA Jr., Spencer FA. Risk factors for venous thromboembolism. Circulation 2003;107 23 Suppl 1:I9-16. Lyman GH, Khorana AA, Falanga A, Clarke-Pearson D, Flowers C, Jahanzeb M, et al. American Society of Clinical Oncology guideline: Recommendations for venous thromboembolism prophylaxis and treatment in patients with cancer. J Clin Oncol 2007;25:5490-505. Khorana AA, Kuderer NM, Culakova E, Lyman GH, Francis CW. Development and validation of a predictive model for chemotherapy-associated thrombosis. Blood 2008;111:4902-7. Ay C, Dunkler D, Marosi C, Chiriac AL, Vormittag R, Simanek R, et al. Prediction of venous thromboembolism in cancer patients. Blood 2010;116:5377-82. Kröger K, Weiland D, Ose C, Neumann N, Weiss S, Hirsch C, et al. Risk factors for venous thromboembolic events in cancer patients. Ann Oncol 2006;17:297-303. Falanga A. Thrombophilia in cancer. Semin Thromb Hemost 2005;31:104-10. Sebastian AJ, Paddon AJ. Clinically unsuspected pulmonary embolism – An important secondary finding in oncology CT. Clin Radiol 2006;61:81-5. Menapace LA, Peterson DR, Berry A, Sousou T, Khorana AA. Symptomatic and incidental thromboembolism are both associated with mortality in pancreatic cancer. Thromb Haemost 2011;106:371-8.
den Exter PL, Hooijer J, Dekkers OM, Huisman MV. Risk of recurrent venous thromboembolism and mortality in patients with cancer incidentally diagnosed with pulmonary embolism: A comparison with symptomatic patients. J Clin Oncol 2011;29:2405-9. Meyer G, Marjanovic Z, Valcke J, Lorcerie B, Gruel Y, Solal-Celigny P, et al. Comparison of low-molecular-weight heparin and warfarin for the secondary prevention of venous thromboembolism in patients with cancer: A randomized controlled study. Arch Intern Med 2002;162:1729-35. Lee AY, Levine MN, Baker RI, Bowden C, Kakkar AK, Prins M, et al. Low-molecular-weight heparin versus a coumarin for the prevention of recurrent venous thromboembolism in patients with cancer. N Engl J Med 2003;349:146-53. Hull RD, Pineo GF, Brant RF, Mah AF, Burke N, Dear R, et al. Long-term low-molecular-weight heparin versus usual care in proximal-vein thrombosis patients with cancer. Am J Med 2006;119:1062-72. Lee AY, Kamphuisen PW, Meyer G, Bauersachs R, Janas MS, Jarner MF, et al. Tinzaparin vs warfarin for treatment of acute venous thromboembolism in patients with active cancer: A randomized clinical trial. JAMA 2015;314:677-86. Deitcher SR, Kessler CM, Merli G, Rigas JR, Lyons RM, Fareed J, et al. Secondary prevention of venous thromboembolic events in patients with active cancer: Enoxaparin alone versus initial enoxaparin followed by warfarin for a 180-day period. Clin Appl Thromb Hemost 2006;12:389-96. Mandalà M, Falanga A, Piccioli A, Prandoni P, Pogliani EM, Labianca R, et al. Venous thromboembolism and cancer: Guidelines of the Italian association of medical oncology (AIOM). Crit Rev Oncol Hematol 2006;59:194-204. Lyman GH, Khorana AA, Kuderer NM, Lee AY, Arcelus JI, Balaban EP, et al. Venous thromboembolism prophylaxis and treatment in patients with cancer: American society of clinical oncology clinical practice guideline update. J Clin Oncol 2013;31:2189-204. Debourdeau P, Kassab Chahmi D, Le Gal G, Kriegel I, Desruennes E, Douard MC, et al. 2008 SOR guidelines for the prevention and treatment of thrombosis associated with central venous catheters in patients with cancer: Report from the working group. Ann Oncol 2009;20:1459-71. Kearon C, Akl EA, Comerota AJ, Prandoni P, Bounameaux H, Goldhaber SZ, et al. Antithrombotic therapy for VTE disease: Antithrombotic Therapy and Prevention of Thrombosis, American College of Chest Physicians Evidence-Based Clinical Practice Guidelines (8th edition). Chest 2012;141 Suppl 2:419S-94SS. Geerts WH, Bergqvist D, Pineo GF, Heit JA, Samama CM, Lassen MR, et al. Prevention of venous thromboembolism: American College of Chest Physicians Evidence-Based Clinical Practice Guidelines (8th edition). Chest 2008;133 Suppl 6:381S-453S. National Comprehensive Cancer Network. Clinical Practice Guidelines in Oncology (NCCN Guidelines®) Venous Thromboembolic Disease, Version 2; 2013. Available from: http://www.nccn.org. [Last accessed on 2014 Mar 01]. Mandalà M, Falanga A, Roila F, ESMO Guidelines Working Group. Management of venous thromboembolism (VTE) in cancer patients: ESMO clinical practice guidelines. Ann Oncol 2011;22 Suppl 6:vi85-92. Mandalà M, Falanga A, Roila F. ESMO Guidelines Working Group. 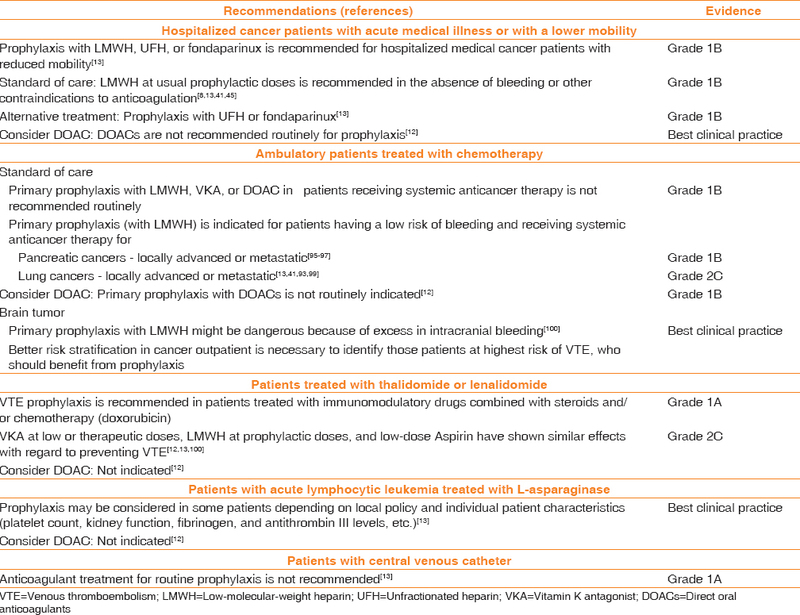 Management of venous thromboembolism in cancer patients: ESMO clinical recommendations. Ann Oncol 2009;20 Suppl 4:182-4. Palumbo A, Rajkumar SV, Dimopoulos MA, Richardson PG, San Miguel J, Barlogie B, et al. Prevention of thalidomide- and lenalidomide-associated thrombosis in myeloma. Leukemia 2008;22:414-23. Dentali F, Gianni M, Agnelli G, Ageno W. Association between inherited thrombophilic abnormalities and central venous catheter thrombosis in patients with cancer: A meta-analysis. J Thromb Haemost 2008;6:70-5. Alikhan R, Cohen AT, Combe S, Samama MM, Desjardins L, Eldor A, et al. Risk factors for venous thromboembolism in hospitalized patients with acute medical illness: Analysis of the MEDENOX study. Arch Intern Med 2004;164:963-8. Khorana AA, Connolly GC. Assessing risk of venous thromboembolism in the patient with cancer. J Clin Oncol 2009;27:4839-47. Lee AY, Peterson EA. Treatment of cancer-associated thrombosis. Blood 2013;122:2310-7. Akl EA, Rohilla S, Barba M, Sperati F, Terrenato I, Muti P, et al. Anticoagulation for the initial treatment of venous thromboembolism in patients with cancer: A systematic review. Cancer 2008;113:1685-94.
van Doormaal FF, Raskob GE, Davidson BL, Decousus H, Gallus A, Lensing AW, et al. Treatment of venous thromboembolism in patients with cancer: Subgroup analysis of the matisse clinical trials. Thromb Haemost 2009;101:762-9. Farge D, Bosquet L, Kassab-Chahmi D, Mismetti P, Elalamy I, Meyer G, et al. 2008 French national guidelines for the treatment of venous thromboembolism in patients with cancer: Report from the working group. Crit Rev Oncol Hematol 2010;73:31-46. Debourdeau P, Elalamy I, de Raignac A, Meria P, Gornet JM, Amah Y, et al. Long-term use of daily subcutaneous low molecular weight heparin in cancer patients with venous thromboembolism: Why hesitate any longer? Support Care Cancer 2008;16:1333-41. Kearon C, Akl EA. Duration of anticoagulant therapy for deep vein thrombosis and pulmonary embolism. Blood 2014;123:1794-801. Mikkola KM, Patel SR, Parker JA, Grodstein F, Goldhaber SZ. Attenuation over 24 hours of the efficacy of thrombolysis of pulmonary embolism among patients with cancer. Am Heart J 1997;134:603-7. Lee AY, Kamphuisen PW. Epidemiology and prevention of catheter-related thrombosis in patients with cancer. J Thromb Haemost 2012;10:1491-9. Kovacs MJ, Kahn SR, Rodger M, Anderson DR, Andreou R, Mangel JE, et al. Apilot study of central venous catheter survival in cancer patients using low-molecular-weight heparin (dalteparin) and warfarin without catheter removal for the treatment of upper extremity deep vein thrombosis (The catheter study). J Thromb Haemost 2007;5:1650-3. Frank DA, Meuse J, Hirsch D, Ibrahim JG, van den Abbeele AD. The treatment and outcome of cancer patients with thromboses on central venous catheters. J Thromb Thrombolysis 2000;10:271-5. Pucheu A, Dierhas M, Leduc B, Sillet-Bach I, Lefort S, Assaf W, et al. Fibrinolysis of deep venous thrombosis on implantable perfusion devices. Apropos of a consecutive series of 57 cases of thrombosis and 32 cases of fibrinolysis. Bull Cancer 1996;83:293-9. Schindler J, Bona RD, Chen HH, Feingold JM, Edwards RL, Tutschka PJ, et al. Regional thrombolysis with Urokinase for central venous catheter-related thrombosis in patients undergoing high-dose chemotherapy with autologous blood stem cell rescue. Clin Appl Thromb Hemost 1999;5:25-9. Carrier M, Le Gal G, Cho R, Tierney S, Rodger M, Lee AY, et al. Dose escalation of low molecular weight heparin to manage recurrent venous thromboembolic events despite systemic anticoagulation in cancer patients. J Thromb Haemost 2009;7:760-5. Sella DM, Oldenburg WA. Complications of inferior vena cava filters. Semin Vasc Surg 2013;26:23-8. Stein PD, Matta F, Sabra MJ. Case fatality rate with vena cava filters in hospitalized stable patients with cancer and pulmonary embolism. Am J Med 2013;126:819-24. Muriel A, Jiménez D, Aujesky D, Bertoletti L, Decousus H, Laporte S, et al. Survival effects of inferior vena cava filter in patients with acute symptomatic venous thromboembolism and a significant bleeding risk. J Am Coll Cardiol 2014;63:1675-83. Schmidt F, Faul C, Dichgans J, Weller M. Low molecular weight heparin for deep vein thrombosis in glioma patients. J Neurol 2002;249:1409-12. Altschuler E, Moosa H, Selker RG, Vertosick FT Jr. The risk and efficacy of anticoagulant therapy in the treatment of thromboembolic complications in patients with primary malignant brain tumors. Neurosurgery 1990;27:74-6. Levin JM, Schiff D, Loeffler JS, Fine HA, Black PM, Wen PY, et al. Complications of therapy for venous thromboembolic disease in patients with brain tumors. Neurology 1993;43:1111-4. Schiff D, DeAngelis LM. Therapy of venous thromboembolism in patients with brain metastases. Cancer 1994;73:493-8. Jo JT, Schiff D, Perry JR. Thrombosis in brain tumors. Semin Thromb Hemost 2014;40:325-31. Carrier M, Khorana AA, Zwicker J, Noble S, Lee AY. Subcommittee on Haemostasis and Malignancy for the SSC of the ISTH et al. Management of challenging cases of patients with cancer-associated thrombosis including recurrent thrombosis and bleeding: Guidance from the SSC of the ISTH. J Thromb Haemost 2013;11:1760-5. Lee AY. Treatment of established thrombotic events in patients with cancer. Thromb Res 2012;129 Suppl 1:S146-53. Akl EA, Terrenato I, Barba M, Sperati F, Sempos EV, Muti P, et al. Low-molecular-weight heparin vs. Unfractionated heparin for perioperative thromboprophylaxis in patients with cancer: A systematic review and meta-analysis. Arch Intern Med 2008;168:1261-9. Akl EA, Terrenato I, Barba M, Sperati F, Muti P, Schünemann HJ, et al. Extended perioperative thromboprophylaxis in patients with cancer. 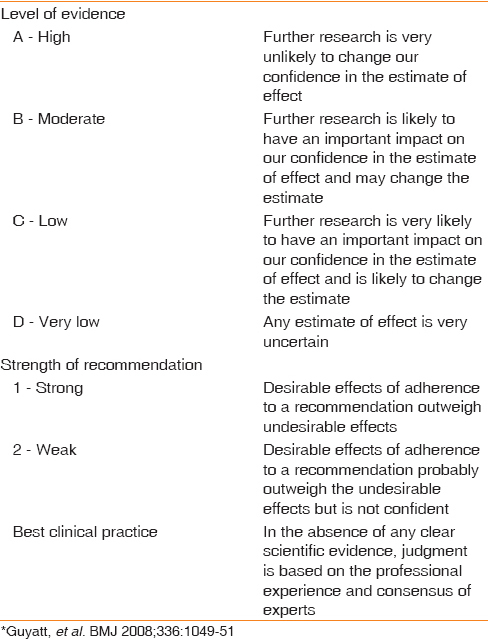 A systematic review. Thromb Haemost 2008;100:1176-80. Tapson VF, Decousus H, Pini M, Chong BH, Froehlich JB, Monreal M, et al. Venous thromboembolism prophylaxis in acutely ill hospitalized medical patients: Findings from the international medical prevention registry on venous thromboembolism. Chest 2007;132:936-45. Kakkar AK, Levine M, Pinedo HM, Wolff R, Wong J. Venous thrombosis in cancer patients: Insights from the FRONTLINE survey. Oncologist 2003;8:381-8. Kahn SR, Panju A, Geerts W, Pineo GF, Desjardins L, Turpie AG, et al. Multicenter evaluation of the use of venous thromboembolism prophylaxis in acutely ill medical patients in Canada. Thromb Res 2007;119:145-55. White RH, Zhou H, Romano PS. Incidence of symptomatic venous thromboembolism after different elective or urgent surgical procedures. Thromb Haemost 2003;90:446-55. Akl EA, Vasireddi SR, Gunukula S, Barba M, Sperati F, Terrenato I, et al. Anticoagulation for the initial treatment of venous thromboembolism in patients with cancer. Cochrane Database Syst Rev 2011;4:CD006649. Mismetti P, Laporte S, Darmon JY, Buchmüller A, Decousus H. Meta-analysis of low molecular weight heparin in the prevention of venous thromboembolism in general surgery. Br J Surg 2001;88:913-30. Einstein MH, Pritts EA, Hartenbach EM. Venous thromboembolism prevention in gynecologic cancer surgery: A systematic review. Gynecol Oncol 2007;105:813-9. Bergqvist D, Burmark US, Flordal PA, Frisell J, Hallböök T, Hedberg M, et al. Low molecular weight heparin started before surgery as prophylaxis against deep vein thrombosis: 2500 versus 5000 XaI units in 2070 patients. Br J Surg 1995;82:496-501. Rasmussen MS, Jorgensen LN, Wille-Jørgensen P, Nielsen JD, Horn A, Mohn AC, et al. Prolonged prophylaxis with dalteparin to prevent late thromboembolic complications in patients undergoing major abdominal surgery: A multicenter randomized open-label study. J Thromb Haemost 2006;4:2384-90. Turpie AG, Hirsh J, Gent M, Julian D, Johnson J. Prevention of deep vein thrombosis in potential neurosurgical patients. A randomized trial comparing graduated compression stockings alone or graduated compression stockings plus intermittent pneumatic compression with control. Arch Intern Med 1989;149:679-81. Dickinson LD, Miller LD, Patel CP, Gupta SK. Enoxaparin increases the incidence of postoperative intracranial hemorrhage when initiated preoperatively for deep venous thrombosis prophylaxis in patients with brain tumors. Neurosurgery 1998;43:1074-81. Maxwell GL, Synan I, Dodge R, Carroll B, Clarke-Pearson DL. Pneumatic compression versus low molecular weight heparin in gynecologic oncology surgery: A randomized trial. Obstet Gynecol 2001;98:989-95. Collen JF, Jackson JL, Shorr AF, Moores LK. Prevention of venous thromboembolism in neurosurgery: A metaanalysis. Chest 2008;134:237-49. Agnelli G, George DJ, Kakkar AK, Fisher W, Lassen MR, Mismetti P, et al. Semuloparin for thromboprophylaxis in patients receiving chemotherapy for cancer. N Engl J Med 2012;366:601-9. Riess H, Pelzer U, Deutschinoff G, Opitz B, Stauch M, Reitzig S, et al. A prospective, randomized trial of chemotherapy with or without the low molecular weight heparin (LMWH) enoxaparin in patients (pts) with advanced pancreatic cancer (APC): Results of the CONKO 004 trial. J Clin Oncol 2009;27 Suppl 18s:LBA4506. Pelzer U, Hilbig A, Stieler JM, Bahra M, Sinn M, Gebauer B, et al. Intensified chemotherapy and simultaneous treatment with heparin in outpatients with pancreatic cancer - the CONKO 004 pilot trial. BMC Cancer 2014;14:204. Maraveyas A, Waters J, Roy R, Fyfe D, Propper D, Lofts F, et al. Gemcitabine versus gemcitabine plus dalteparin thromboprophylaxis in pancreatic cancer. Eur J Cancer 2012;48:1283-92. Haas SK, Freund M, Heigener D, Heilmann L, Kemkes-Matthes B, von Tempelhoff GF, et al. Low-molecular-weight heparin versus placebo for the prevention of venous thromboembolism in metastatic breast cancer or stage III/IV lung cancer. Clin Appl Thromb Hemost 2012;18:159-65. Verso M, Gussoni G, Agnelli G. Prevention of venous thromboembolism in patients with advanced lung cancer receiving chemotherapy: A combined analysis of the PROTECHT and TOPIC-2 studies. J Thromb Haemost 2010;8:1649-51. Palumbo A, Cavo M, Bringhen S, Zamagni E, Romano A, Patriarca F, et al. Aspirin, warfarin, or enoxaparin thromboprophylaxis in patients with multiple myeloma treated with thalidomide: A phase III, open-label, randomized trial. J Clin Oncol 2011;29:986-93. Perry SL, Bohlin C, Reardon DA, Desjardins A, Friedman AH, Friedman HS, et al. Tinzaparin prophylaxis against venous thromboembolic complications in brain tumor patients. J Neurooncol 2009;95:129-34. Larocca A, Cavallo F, Bringhen S, Di Raimondo F, Falanga A, Evangelista A, et al. Aspirin or enoxaparin thromboprophylaxis for patients with newly diagnosed multiple myeloma treated with lenalidomide. Blood 2012;119:933-9. Meister B, Kropshofer G, Klein-Franke A, Strasak AM, Hager J, Streif W, et al. Comparison of low-molecular-weight heparin and antithrombin versus antithrombin alone for the prevention of symptomatic venous thromboembolism in children with acute lymphoblastic leukemia. Pediatr Blood Cancer 2008;50:298-303. Mitchell L, Andrew M, Hanna K, Abshire T, Halton J, Wu J, et al. Trend to efficacy and safety using antithrombin concentrate in prevention of thrombosis in children receiving l-asparaginase for acute lymphoblastic leukemia. Results of the PAARKA study. Thromb Haemost 2003;90:235-44.